A pipe stress analysis (thermal flexibility analysis) predicts stresses in piping and loads on equipment resulting from thermal gradients, thermal transients, weights, pressure, and bolt-up strain. This study is typically required for piping that experiences high temperature fluctuations, or for long pipe runs such as hot piping to coolers or headers. Cases where equipment is sensitive to external loads may also require a pipe stress analysis. The study methodology becomes more complicated for piping systems in vibratory service. As discussed below, the design must address conflicting requirements between the pipe stress analysis (where flexibility is desired) versus the mechanical vibration analysis (which requires stiff supports). Methods are available to manage this conflict and create an optimal piping design. 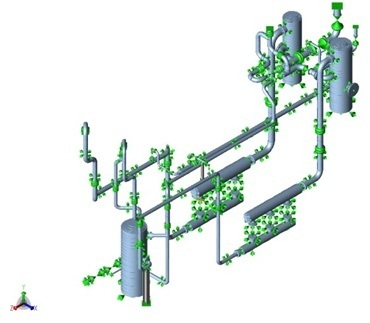 Learn when a piping stress/flexibility analysis is required, which codes and factors to consider and how to avoid common mistakes to ensure a safe design. Learn how to balance the requirements for both effective vibration support and sufficient piping stress flexibility using our latest pipe stress analysis tools and techniques. Learn how to select the right pipe clamp for vibration and thermal growth applications. This analysis calculates piping stresses resulting from thermal cycles, pipe and fitting weights, and static pressure for the main process piping. Generally, CAESAR II is used for modeling the system, although other specialty computer programs such as NozzlePRO and FETee are sometimes required. When machinery is involved in the piping system, the same consultants performing the dynamic mechanical finite element analysis (FEA) should also complete the Pipe Stress Analysis. This will avoid conflicts between stiffness assumptions and requirements for supports, and also expedite a solution. Typically, dynamic mechanical analysis will specify high stiffness supports, while piping flexibility analysis will require flexible supports. It is important to simultaneously consider both static and dynamic requirements. Controlling vibration, and vibratory stress typically involves restraining the pipe. It also requires closer spacing of pipe supports (between clamps) to raise the mechanical natural frequency of the pipe to avoid resonance. Vibration control standards also require that pipe supports have enough stiffness to stop vibration at the support and caution against the use of hangers and guides. A pipe stress analysis mitigates static deflections and stresses and typically involves selectively providing flexibility with a mixture of rest supports, guides, line stops, hangers, spring supports, and hold downs. Recommendations for the pipe stress analysis can be directly opposite to the vibration design requirements. This conflict can, and does, result in significant confusion and problems during construction and operations. To avoid this conflict, the standard industry approach is to have the same consultant perform both the vibration analysis and the piping stress analysis. This ensures the vibration control and piping design are adequately addressed, including realistic pipe support stiffness assumptions, and use of vibratory clamps/restraints that have enough flexibility for thermal growth (see articles below for more info).